Goodnight Elementary School will be voting to change their mascot from the Gophers to either the "Buffaloes" or the "Longhorns". This is exciting as this came about through the Barn's adoption of Goodnight School and our presentation to the 4th graders at Goodnight Elementary School. The Barn works with History Connections of Pueblo to add more local history to our school's curriculum. History Connections of Pueblo appeared before the Board of Education as they presented gifts to schools that they had adopted. Goodnight Barn Historic Preservation Committee presented Charles Goodnight photos and story boards to Goodnight. 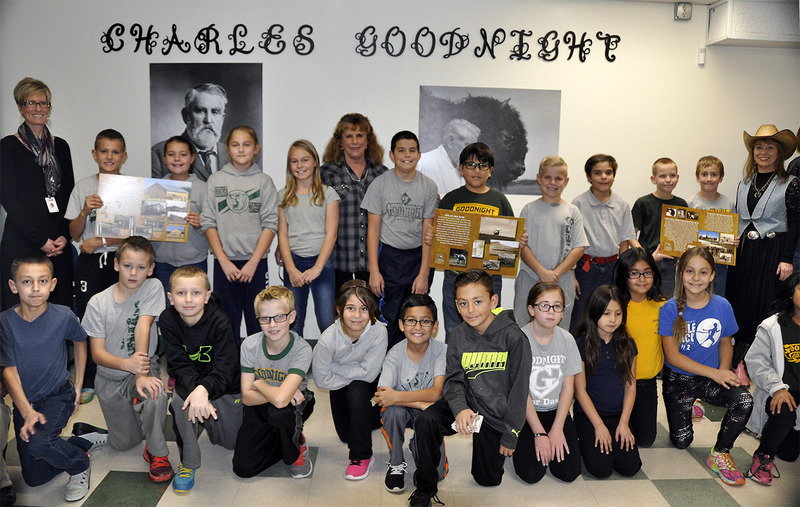 Laurel Campbell and Linda Crawford of Goodnight Barn Historic Preservation Committee gave a Colorado history presentation to the Goodnight 4th graders with a focus on Charles Goodnight. During the question and answer session afterwards, one of the students asked why our Goodnight mascot is a gopher. This began our discussion on a possible change of mascot that reflects the Charles Goodnight legacy. Dalton Sprouse emailed Andrea Glaeser and Amy Thielemier as a follow up to the student’s question and the possibility that our school may want to consider updating mascots. Students in each classroom will vote between the two mascot and color choices. During conferences, parents will be notified of the change in colors and mascot to allow them to prepare for the uniform change that will be implemented during the August 2016-17 school year. There will be a school kickoff during which all students will be given a shirt with the new mascot and colors. Our intention is to have a chuck wagon lunch for the students, since Charles Goodnight is credited with inventing the chuck wagon. We will work closely with Dalton Sprouse to involve the community for this event. New uniforms will be in place with a grace period for older Goodnight shirts until August 2017. Staff observations will be taking place to identify students that might need assistance and Goodnight will provide shirts to them with the new colors. Full transition to the new colors and mascot will be complete. Goodnight will purchase mascot shirts to have on site for low-income students.